Meachers would like to hear from you. Fill out the form and we'll be in touch. 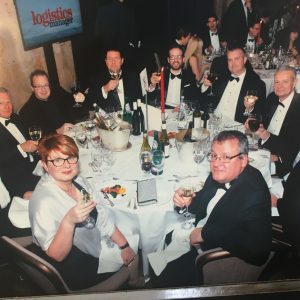 After already winning one of the leading transport awards this year, Meachers Global Logistics as a key member of the Solent Alliance and, one of the UK’s leading independent providers of logistics services, was Highly Commended for Environmental Improvement at this year’s Supply Chain Excellence Awards. Together with Isle of Wight based Steve Porter Transport, and Solent ferry operator, Red Funnel Ferries, Meachers had been shortlisted for the Logistics and Distribution category for the 2017 Supply Chain Excellence Awards but during the awards ceremony, held at London’s Park Lane Hilton, it was announced that after the judges viewed their entry, they felt compelled to recognise the Partnership for the dramatic improvements they have made to the local environment. These annual awards celebrate, recognise and reward organisations around the world that demonstrate excellence in their supply chain operations. The three organisations have once again been recoginised for the formation of the Solent Alliance; an innovative and unique partnership facilitating a smarter Logistics and Distribution network for deliveries to the Isle of Wight; after winning the Motor Transport Partnership award in July. This unique three-way Solent alliance has improved the breadth of services available to freight customers serving the Isle of Wight via Southampton. Businesses and retailers are provided with a full range of drop-trailer, full load and consolidated services to and from the Island.